Did you know that a weak screenplay structure is one of the Top 7 Deadly Flaws of a Bad Screenplay? If you wonder if YOUR structure is tight check it out with the screenplays we analyze, making use of the Michael Hauge model. Who would be better placed to speak about the screenplay structure of Gladiator than its main character, the General Maximus? We asked our structure expert, Sean, aka Structor, to go and speak to him. For another example of screenplay structure in 11 pictures, check Structor's interview with Neil Perry from Dead Poets Society. check as well when they should happen (i.e. at what percentage of your story). If you miss some turning points and/or stages, or if some stages are really too long, this is your opportunity to fix these issues. General Maximus, you're about to confront the Emperor Commodus in the Colosseum in a few hours. Thank you so much for taking the time to speak to me about screenplay structure. If you were to look back at your life with its very high peaks and its extreme lows what would you say about it? My friend and screenplay structure expert Michael Hauge says a screenplay structure is made of 6 stages and 5 turning points. And so is my life as a character. I'll will be soon living my 5th turning point, the climax. Talking about Michael Hauge, the first stage in his screenplay structure model is the set up. And it has 3 objectives. The first one is to pull the reader / audience in the initial setting of the story. 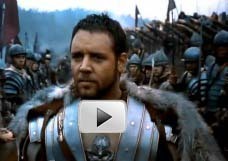 How does that get fulfilled in the screenplay structure of Gladiator? The setting is a war field. Hell is unleashed. As a reader or viewer you get drawn into the battle because of its suspense and intensity. And it goes till the bitter end, until there's no one left to fight. Until the enemy knows they're conquered. This leads to the second objective of the setup: showing the daily life of the hero that you are. You see me leading the terrifying and relentless cavalry charge of the troops of Rome, fighting on the ground, and finally celebrating the defeat of the army of Germania. What was your family situation at the time? I had been away too long - 2 years and 264 days. I had forgotten my wife's face and I barely knew my son. The third objective of the setup in the screenplay structure is the identification with the hero that you are. What would you say takes care of it? The courage I demonstrate, the care for my troops, my loyalty to the emperor Marcus Aurelius. And there is this dedication to something bigger than I am. I've never been to Rome, but it lives in my heart. It's a thing inside me that came from my ancestors and that I gave to my child. 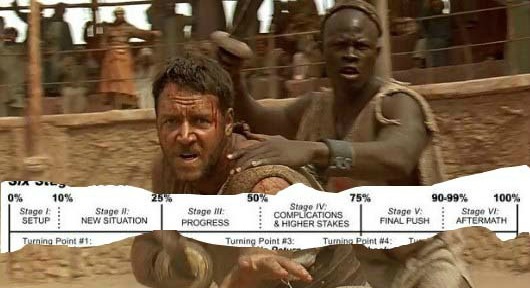 Not only a screenplay structure has stages, but it has also turning points. Yes. The Emperor Marcus Aurelius asked me a very unusual question: So I said: going home. For one season, or two. You started getting accustomed to the idea of going home. But then the Emperor told you the special plans he had for you. Were you surprised? Yes, I told him he did me honor - but his son Commodus had pride of place for succession. Back to my tent, I thought it over and decided to accept Marcus offer. But it was too late. You never had the opportunity to tell your decision to the Emperor? No, he got killed by his son Commodus during the same night. Marcus Aurelius had always been a father for me. 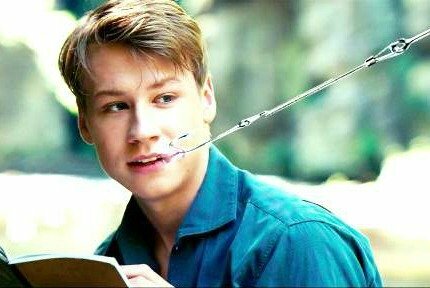 He wasn't of course my father but I cared for him very much. His murder was a turning point in my life and in the screenplay structure. My original desire to go home was suddenly trivial. I had suddenly a specific goal with a clearly defined end point : I would avenge Marcus Aurelius and fulfill his wish. and in the second Act of my life. This was a dangerous decision to go against the new Emperor Commodus. Suddenly you faced many obstacles. You overcame them. But at what price. Yes, Commodus had me arrested and nearly killed - but I could escape. My family did not - I... I arrived too late. Commodus men had already slaughtered them. You got then kidnapped and sold to Proximo, a slave merchant. Did he notice you were a soldier? Yes, because of the way I was fighting and defeating other gladiators... because of the wounds on my body - a sign of long campaigns, and the way I eyed the world around me like an enemy. Being a soldier allowed me to survive. We get now to a crossroad in your life and in the screenplay structure. You could have stayed fighting in the province, butchering the other gladiators, like Proximo would say. Instead you chose to burn the bridges behind you, fully commit to your goal and taking a much bigger risk than before. Why? Commodus had arranged a series of spectacles in Rome to commemorate Marcus Aurelius. According to the tradition, the Emperor was to go to the arena and grant freedom to the last gladiator standing. I saw my chance to face Commodus and kill him. So I asked Proximo to go to Rome. He used to be a gladiator. And got freed up by the emperor Aurelius. He understood my wish and accepted. When did you realize that achieving your goal would be far more difficult than you thought? When I saw fifty-thousand Romans watching every movement of my sword, wanting me to make that killer blow. I then realized that I had much more to lose if I failed. How could I salute him when he killed the real Emperor and wanted to murder me? Right, but you refused to kill Tigris of Gaul, the gladiator you defeated, while the Emperor ordered you to. That was partly inside the advice Proximo gave me: "win the crowd and you'll win your freedom". Finally you refused to give your name and you turned your back to the Emperor. I wanted to trigger him. It really worked. The Emperor was furious. I interviewed people in Storyville. They all talked about the slave who was more powerful than the Emperor. This victory did not last long though. Rumor has it that the Emperor got vexed by this incident. Yes, that's why he had to show his power and put me into a cell. I met the sister of the Emperor, Lucilla, in Storyville. She said she came to see you in prison and proposed to help you overturn the Emperor with the support of the Senator Gracchus. You turned her down. Why? What else could I have down? All seemed lost. I had been so close to the Emperor and I was now so far away from fulfilling my mission. Alone, in a cell. I was a slave, what possible difference could I have made? What had you change your mind? I finally realized I had nothing to lose. So, I decided to risk everything to achieve my ultimate goal. From that moment on, the pace accelerated, the conflict became overwhelming. Gracchus got arrested, Proximo got killed while helping me escaping, I fell into a trap and got back to jail. I met a guard who said the Emperor visited you in your cell. What did he say to you? "The slave who became a gladiator. The gladiator who defied an emperor. A striking story. Now the people want to know how the story ends. Only a famous death will do. He then sliced a knife into my back and said to the guards: He added he would fight me in the Colosseum in front of everyone. Structor did not get the chance to complete this interview with General Maximus as a group of men stormed in the room and took him away. Later on, his fight with the Emperor Commodus had a deadly outcome for both of them. Maximus faced the biggest obstacle of the entire story, the Emperor Commodus. Maximus' objectives got met once and for all.. He killed Commodus and realized the dream of Marcus Aurelius to give Rome back to the Senate. The story of Maximus and the screenplay structure of Gladiator did not end precisely with the resolution of the hero's objectives. Maximus died in the arena, but he died as a hero and as a free man. A kid I met later on in Storyville said he saw Maximus walking in a field, joining his son and wife in the light. For sure the legend of Maximus is still very much alive, both in Storyville and in Lake Structure.